Like most animals, hamsters thrive when allowed a healthy, balanced diet containing the right amount of proteins, vitamins, minerals and fats. If you happen to run out of your hamster's base diet, you can feed her a few different things commonly found in your kitchen for a day or two until you're able to restock her base diet. Vegetables provide vitamins and minerals to your hamster and are welcomed treats in addition to their kibble. Fresh vegetables such as broccoli, cucumber, green bell peppers, peas, spinach and squash are ideal. Hamsters, like other small animals, tend to love crunchy foods, and fresh vegetables fulfill their need to chew while also providing healthy snacks. If you have a dwarf hamster, stay away from the fruits as dwarf hamsters are very prone to diabetes and the additional sugars could affect her in a negative way. Syrian hamsters, on the other hand, can handle the sugars better, although they should still be fed sparingly. 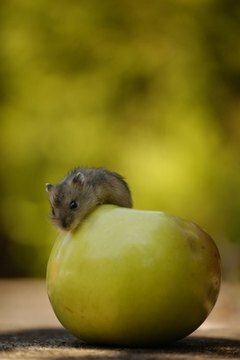 Syrian hamsters will enjoy apples, bananas, blueberries, grapes and melons, among other fruits. Always remove any seeds from fruits before serving. In small quantities, certain grains and proteins are an ideal treat not to mention a way to easily give your hamster nutrition while you're out of kibble. Cooked eggs, tofu, flax or pumpkin seeds will be welcomed protein sources. Whole-wheat toast, millet sprays and whole oats are a good diet replacement for a day or two. Alfalfa and timothy hay are acceptable as a treat and to substitute for kibble for a day or so. Avoid anything that's processed, sugary or salty. A good rule of thumb is to stick to whole foods. Avoid feeding her chocolate, green potatoes, garlic and the green parts of tomato plants as these can be toxic to her. Also avoid salt and mineral wheels, as they're bleached or made with glues and plastics that could be harmful to her health.